Second newsletter for Term 4. LA presentations this week … along with a holiday on Friday! Just a reminder that as a Y1-13 school, we are not involved in the current strike action happening across the country. School will continue has normal. The Deputy Directors and myself have interviewed just over 100 students and their families this week. These families have been to the tours, understand the school and are desperate to be part of our community. I have met so many fantastic people this week, that I’m completely exhausted from smiling at their passions and interests. Fantastic people with fantastic stories. Unfortunately most of them (about 75% of them) will end up on our ballot for 2019. In my opinion this is a really sad situation for Christchurch to be in. There is clearly enough demand for us to be able to increase our Y1-8 roll from 220 to 300. We are not however in a position where we can accommodate these students. Our Y9-13 roll is just as in demand as the Y1-8 roll and needs to continue to grow across the next couple of years. I’m really happy that we are able to provide a personalised approach to student directed learning for all of the students enrolled here, but I must admit to feeling frustrated that so many students will have to rely on their local schools to try and support their learning. Christchurch has fantastic primary schools, but it is of course challenging for them to do what we must do. Our special character designation means it is not negotiable. Inquiry, curiosity, discovery time, student centred learning, modern learning and so on, are all embedded in other schools, but it’s not a condition of entry like it is with us. 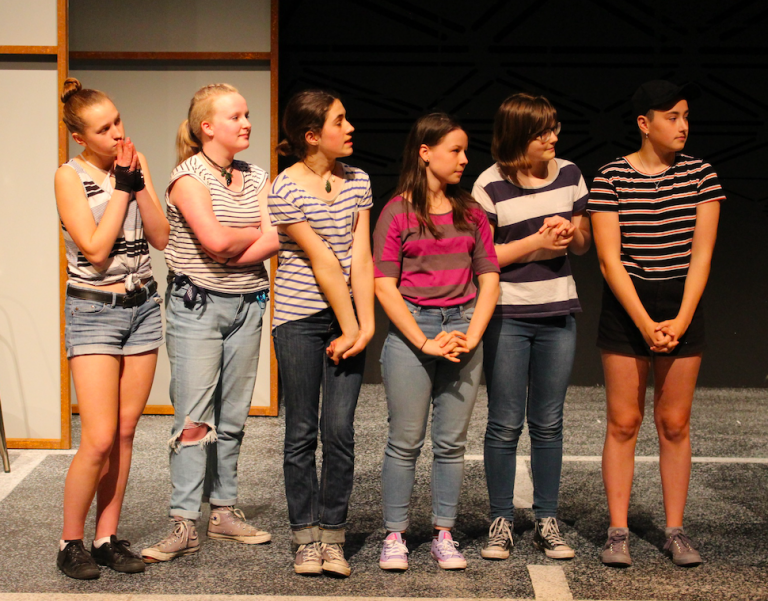 When you think about the amazing journey that our students are allowed to go on (just watch the graduation on facebook), I just can’t help but wish that we had an “Ao Tawhiti Unlimited Discovery 2” to continue to ensure that all students who want this type of education, can access it. Another awesome graduation. There were some fantastic messages shared by students and staff on the evening. Amy and Kye did a great job of summing up all that’s great about being a student here. You can check out the feed on the school’s facebook page. We had a couple of issues with the feed but most of it made its way online. Every year I get lots of thanks for organising the event. The truth of the matter is that I really just turn up, say something and shake the graduates’ hands. Duncan on the other hand, spends weeks organising this event. There is a huge amount of leadership from him to make this event possible so if you get the chance, take a sec to thank him for another awesome graduation. I continue to be amazed that the building is progressing as planned. There are windows going in everywhere. The steel for the balconies has gone in. There is internal work going on to. It’s extremely exciting to see. Check it out for yourself some time this week … maybe after you’ve gone to watch a movie. Just another reminder that we are interviewing for a Y1-6 LA for next year. This position has been funded by the Board of Trustees to allow the HBLAs at the Discovery Campus to meet our Y1-6 students for 1:1s. While I’m really excited about creating the opportunity for 1:1s for all of our students, I’m also really excited to add another LA to the staff for 2019. The presentations for this position will start at 3.20pm on Tuesday. Come along, see what they have to say and offer the interview panel some thoughts for the interviews. We are going to readvertise the Y7-10 HBLA role at the Unlimited Campus, in the hope that we can get several candidates with the right mix of subjects for the Y7-13 students. We’ve had a massive week this week with our Year 1-6 interviews. I think we’ve seen about 100 families and it’s been a really great experience to meet all of these amazing kids and whanau. One of the questions in the interview is around our Special Character and what it means to them and how they see it working for them. Most of the people I spoke to discussed the opportunity for their children to follow their own path, investigate their passions and go on a personal journey. I found myself reflecting on the previous Friday at our Graduation and recognising, for all of those students we farewelled, that we heard about a massive variety of experiences and pathways. I was totally impressed by the stories we all heard of what these amazing young adults had been doing over the last few years and the plans that they had for their futures. It reminded me about why I choose to work at this school. It’s not a cookie cutter experience. It’s definitely about encouraging and supporting our students to find their passions, the things they love doing and to follow them. To take advantage of the flexibility we offer and to create a pathway that they are truly happy with. I’ve always felt that “success” wasn’t about the money you make or the things you have, it’s about waking up every morning and being excited and happy to go to work, because whatever you’re doing is something you love doing. If we can set our students up to be able to find that thing I think we’ve done our job well. Thank you so much for your support with this community initiative. 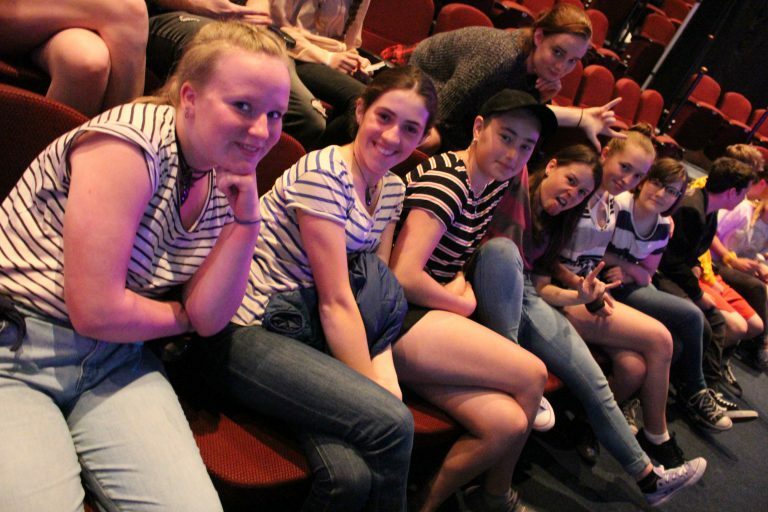 Thanks in particular go to Vanessa Seath for having the vision and planning skills to organise this cool event, and to Jill Legg for her assistance with finance. We were so gutted when Flip Out’s owner, Andrew, called to say he had double-booked us. We hope it does not muck things up for too many people. Andrew has been very accommodating, offering anyone who bought a ticket a free pass, and extending the evening to 2 hours. Please contact Vanessa Seath (davenness@hotmail.com) if you need to make any changes, and Jill (accounts@aotawhiti.school.nz) if you need a refund. There have been a number of students wishing to carry out fundraising activities at the Discovery campus. While we love to encourage entrepreneurship, we are also aware of ‘fundraising fatigue’ and families constantly being asked for money. There is a process to go through if children would like to raise funds. They need to get in touch with Niki for a ‘Fundraising or Grant Application’ form. They fill this in, together with an adult for support, and submit it back to Niki. This is also shared with Jill Legg, our finance administrator. The application is discussed, further details requested if necessary and a decision made. The student is then told of the decision and some next steps, such as advertising are discussed. Please get in touch if you have any queries about this process. We are having a break from being in town for a couple of weeks. Back into it on 30 November. Huge thanks to staff and parent helpers who braved the cold and rain last Friday! As you are all aware, we will be one physical school by April next year. Floors will be allocated to year groups, so Y1-6 will take up residence on one floor, Y7-10 on another and Y11-13 on another. The final floor has been allocated to Y7-13 as our roll grows. Y1-6 will continue to have 2 communities, Y0-3 and Y4-6. The junior community will be led by Nadine Walmisley along with the LAs Gina Harrison and Mel Fisk. Melva Gill will be the leader of the Y4-6 community, along with LAs Suze Keys and Libby Boyd. Nadine’s community will be based in what is currently HB Tuatara, and Melva’s community will be based in what is currently HB Phoenix. The HB currently occupied by HB Hawk will be used as an SLD/ teaching/ breakout space as needed. This will begin in term 1 2019 in preparation for our shift to town. Being based all on one floor means communities will be working closer together. There will be an information session on Monday 26 November (time TBC) where you can come and ask questions, find out more and talk to myself, the CLs and LAs. Once again it was an amazing night! I get to stand in a pretty privileged position on the night. Up close to the graduates and their LA. It’s a pretty powerful experience as one by one they are simultaneously celebrated and given a farewell by someone who has taken the time to get to know them and who really cares for them. There’s a lot of work that goes into making it a successful evening. From writing citations, proof reading, certificates, sorting hoodies, performances, setting up, tech solutions, etc..It really is a team effort. Many thanks to all those who contributed to making it a wonderful occasion. We did live stream the event and despite some glitches have managed to capture it on Facebook. Go check it out here if you’re keen. Among the highlights for me were Amy and Kye and the phenomenal speeches they delivered. 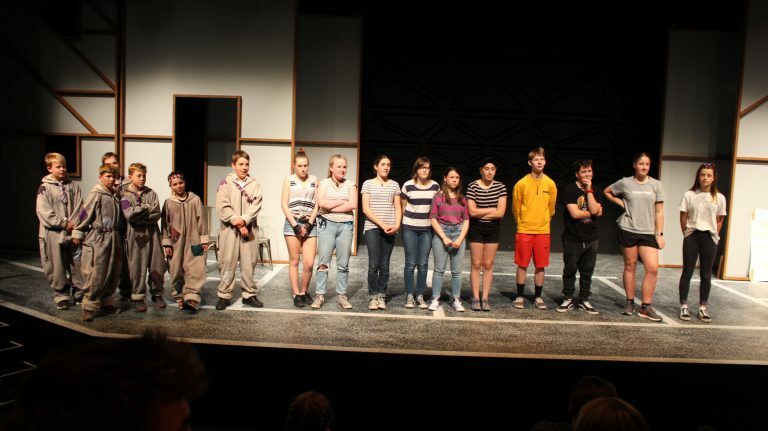 If you missed them on the night but want to get a sense of the impact that our school can have on a young person’s life it’s well worth a watch. If you follow this link and scroll to about the 31:40 mark you can check them out. On Sunday last week Derrin and Lewis ran a quiz night to raise funds for the Cancer Society and Amnesty International. It was a fun night (despite how tough the questions were!). Congratulations to 4 non blondes who took it out on the night. I’ve had a few enquiries from students in year 10 who are asking to move into an 11 – 13 homebase. At this stage it is unlikely that we will be able to accommodate many students being able to do this. With a full roll the allocation of LAs to communities and the resulting HB spaces is tight. We have to fill the spaces with year 11-13 students in the first instance. Once this is completed and we have an idea of where (if any) spaces are left we are then able to consider any movement between communities. The best advice I can offer at this stage is to make sure that anyone in this situation completes a 7-10 HBLA selection so that if spaces do not open up they don’t end having to be placed in a 7-10HB. 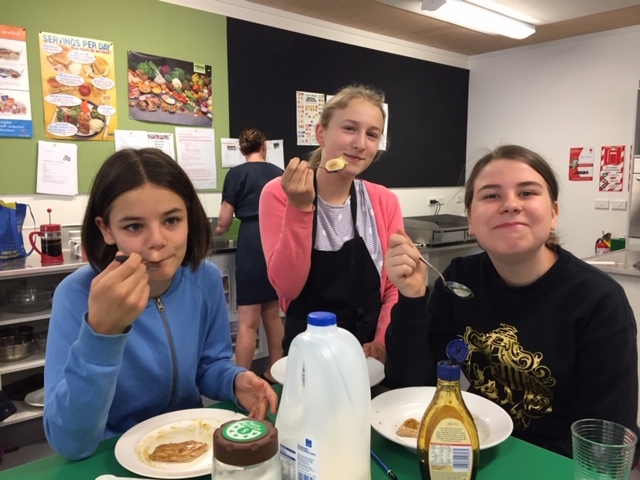 We are looking forward to being in the new building next year and having a whole school Breakfast Club on Wednesday mornings. 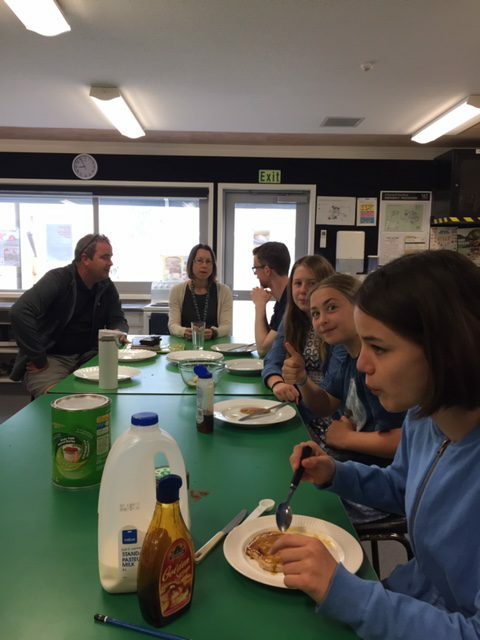 In the meantime, we have created a quick survey to find out what everyone would like from Breakfast Club, and how to improve it for the rest of this term and the start of next year. Please let us know what you think! 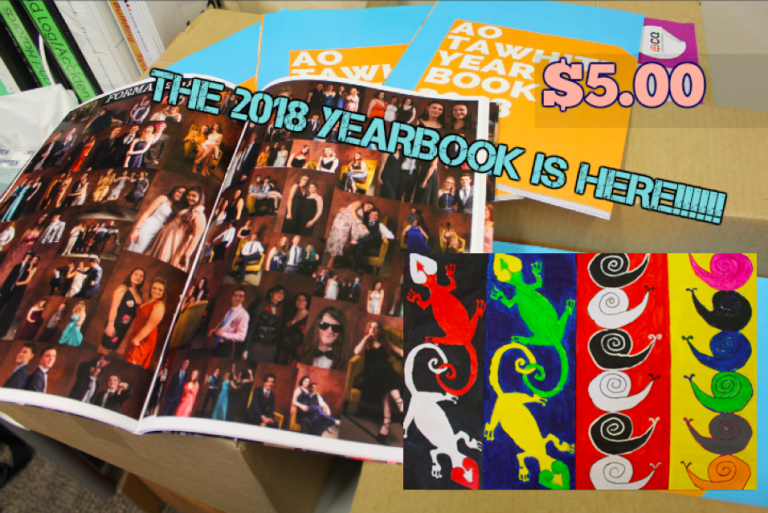 The Yearbook is now available for purchase! $5.00. On the Unlimited Campus copies will be available from Jill Legg in the Accounts office found in the Otakaro Building Level 2. Students can either pay straight to her or get the Yearbook charged to their school account. There are limited copies so be in quick! Discovery Campus will have some books there as well for students to pay or get the book charged to their school accounts. Please see Jacinta Buist in the Discovery office. On Thursday 8th November Gina and I were privileged to attend a day long professional development course with Niki Buchan of Natural Learning and Real World Learning. 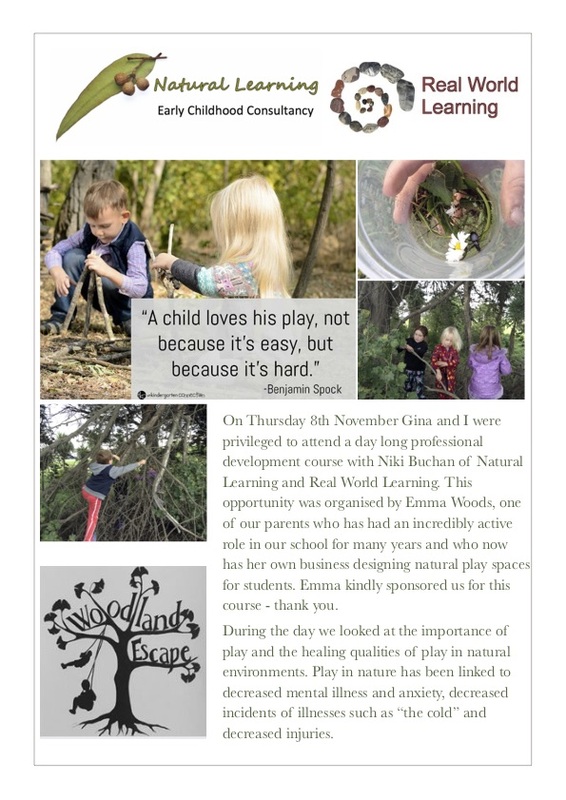 This opportunity was organised by Emma Woods, one of our parents who has had an incredibly active role in our school for many years and who now has her own business designing natural play spaces for students. Emma kindly sponsored us for this course – thank you. During the day we looked at the importance of play and the healing qualities of play in natural environments. Play in nature has been linked to decreased mental illness and anxiety, decreased incidents of illnesses such as “the cold” and decreased injuries. 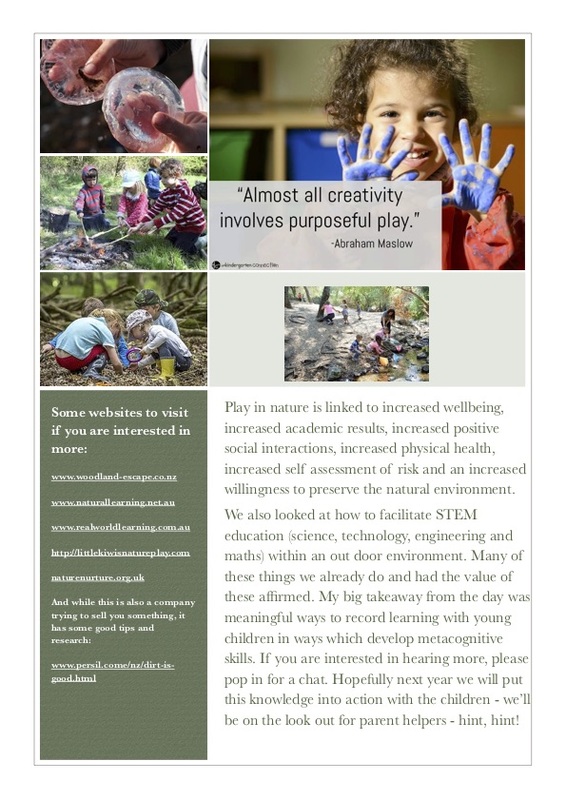 Play in nature is linked to increased wellbeing, increased academic results, increased positive social interactions, increased physical health, increased self assessment of risk and an increased willingness to preserve the natural environment. We also looked at how to facilitate STEM education (science, technology, engineering and maths) within an outdoor environment. 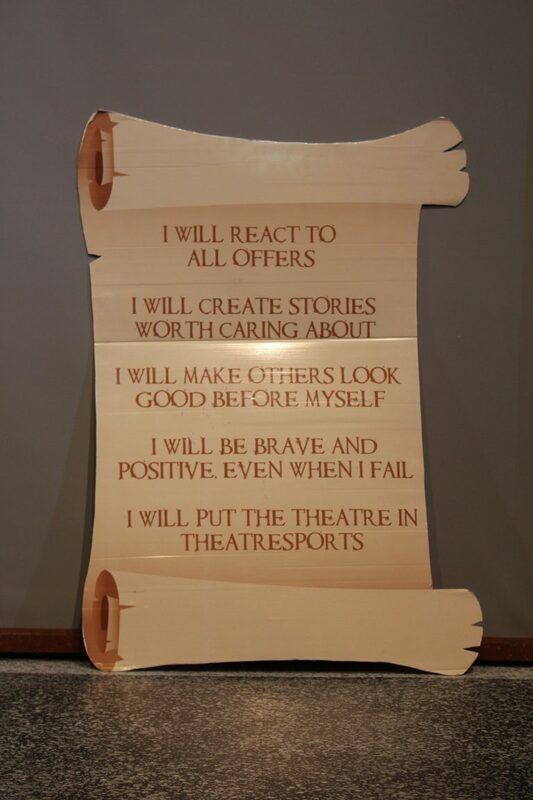 Many of these things we already do and had the value of these affirmed. My big takeaway from the day was meaningful ways to record learning with young children in ways which develop metacognitive skills. If you are interested in hearing more, please pop in for a chat. Hopefully next year we will put this knowledge into action with the children – we’ll be on the look out for parent helpers – hint, hint! 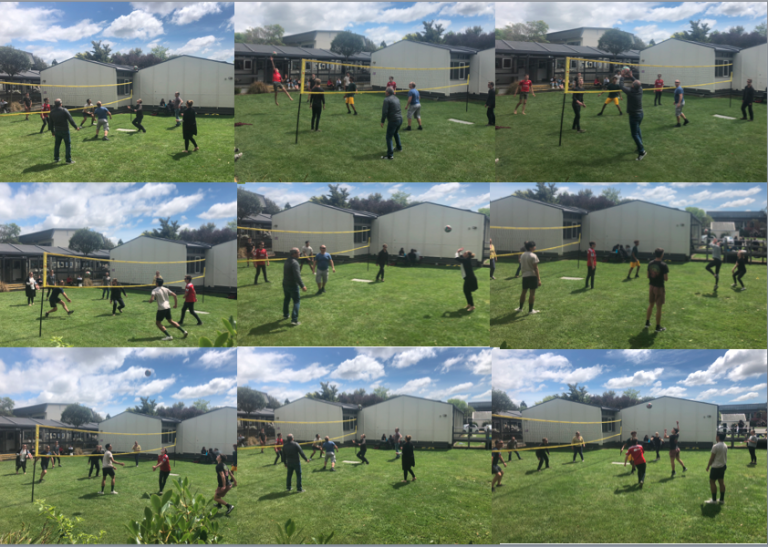 Another great game of volleyball against the staff and students. After taking out one round each, the students took the final which gave them the 2018 win. Thank you to all those who participated and supported! 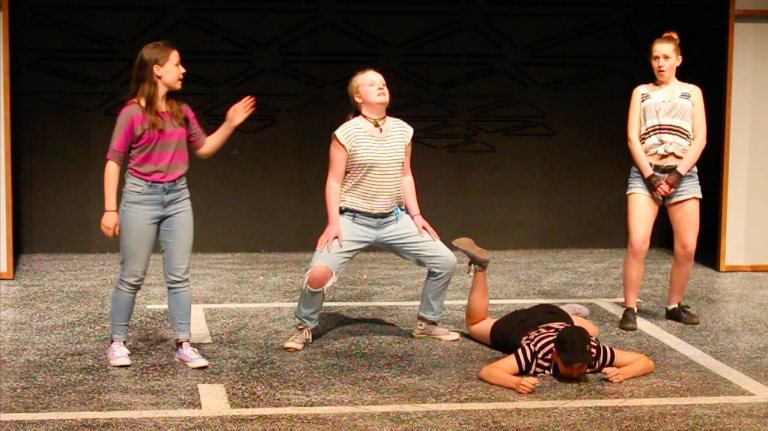 Theatresports is where a player has to be able to make up things to act on the spot and Ao Tawhiti has finally made it to the Junior Improvisation Finals on Sunday 2nd December at The Court Theatre. 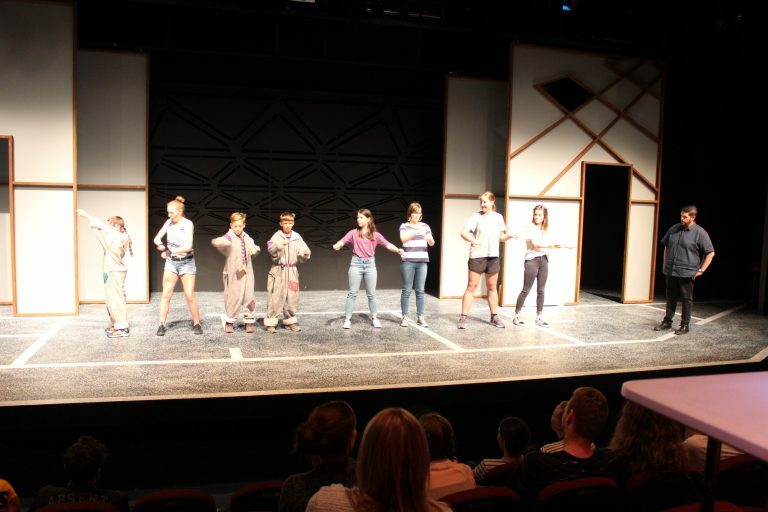 On Sunday first time students to the Theatresports genre Nic, Celeste, Ngaire, Abigail, Grace and Georgia were able to beat out Papanui High and Medbury School in their heat. 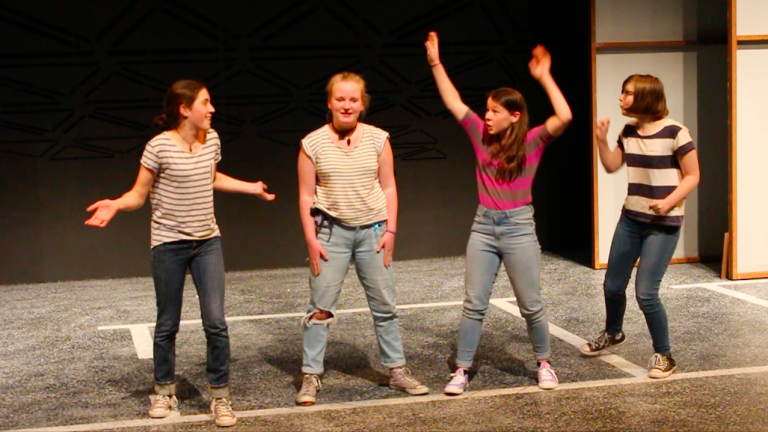 Thanks to their coach Barrett Robb for taking them through the spontaneity of all the improv-games and leading them during the year. Our year 7s will be vision screened on 23rd November at 9.15 in the counselling room. It’s a really quick check, takes about a minute, and is good to get done! This week many students will be making elderflower syrup and we need lots of bottles. If you have any spare bottles suitable for syrup could you please send them into Kay in P12. We need them for Wednesday morning Parent Led Workshops. Once again Andrew and Regina invited us to volunteer at the Motukarara Fireworks night. We had a number of students running their own stall and a significant number of families volunteer. This is such a fantastic opportunity for students and families to raise money for a special cause or for their own projects. Once all has been settled and final monies counted we should have raised something in the region of $2000. 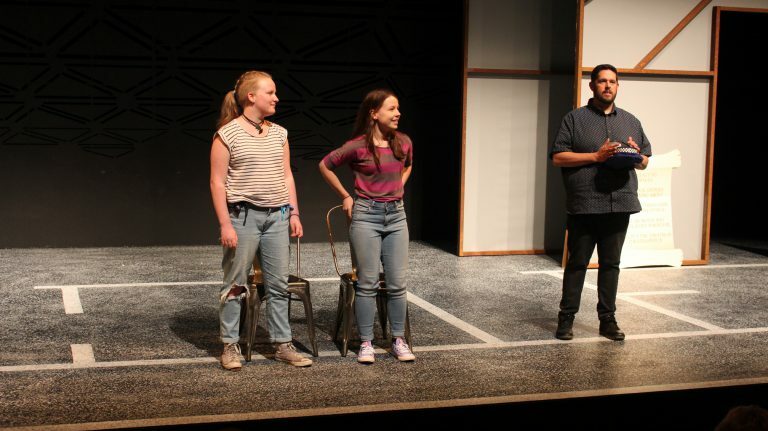 Students have raised money for a school in Tanzania, for the Otakaro Orchard, for Space camp and so much more. Thank you to everyone who volunteered and especially to Andrew and Regina who do a significant amount of work as well. Last Sunday Derrin and Lewis organised a quiz night fundraiser for an Ao Tawhiti Project. They were raising money for the Cancer Society and Amnesty International. The event was a huge success with 10 or more tables and about 40 people. Well done Derrin and Lewis. A couple of weeks ago the LA’s in my community had the fantastic opportunity to try and break out of prison. This was thanks to Andrew Dean and we highly recommend it! The Crate Escape group have 3 escape rooms and the Prison Escape is their latest. It is so much fun and an interesting experience for all kinds of groups. The Prison Escape is R13 and I could imagine a group of older students doing it for a birthday get together. There are two other escape rooms one for all ages and another R13.